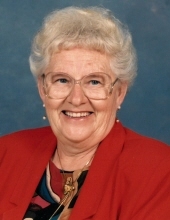 Elizabeth Fichtel Tiefenbach, 88, passed away March 10, 2019 at the Arbors of Mifflin where she resided since September 2018 after fracturing bones in a fall at home. She had suffered from dementia for the past three years. Elizabeth was born May 12, 1930 in Galicia, Poland, the youngest of 12 children of the late Otilia and Wencel Fichtel. When she was 12, Elizabeth and her mother were forced to leave their village by train on a cattle car ahead of the advancing Russian Army during World War II. They spent the next four years in refugee camps and working on farms in rural Austria where she met her husband John, a refugee from Yugoslavia. They were married on August 11, 1946. She wore a white gown of parachute silk bartered from American peacekeeping soldiers in Austria after the war. John and Elizabeth and their two Austrian-born daughters came to America in 1951 and settled in Fine Mills Creek, near Richmond, Virginia where John had agreed to work for one year to repay their passage. Because living conditions were very poor on the farm, they contacted a family friend who brought them to Mansfield. John had to remain behind to fulfill his obligation to work for a year. Unable to speak English, Elizabeth found a job at the North American Knitting Mill, a local company which employed many immigrant women as seamstresses. She belonged to the Mansfield Liederkranz and enjoyed the company of many ethnic European families, keeping their old country traditions alive while assimilating to their new culture. Elizabeth liked nothing more than hosting family gatherings and tending vegetables and flowers in the large garden around her home. She and her husband enjoyed being snowbirds, spending winters in Florida for more than 20 years. They also took great pleasure in family vacations on Lake Erie with children and grandchildren. Elizabeth was a lifelong member of St. Mary’s Catholic Church where she volunteered, especially making German food for festivals and bake sales. Elizabeth is survived by her husband of 72 years, John, who lovingly cared for her in their later years, and daughters Anne (Larry) Miller, Katherine Foss, Carol (Mike) Daugherty, all of Mansfield, and Jeffrey (Renee) Tiefenbach of Naples, Fla.. Her grandchildren are Steven (Miranda) Foss, Bryan (Tony) Foss, Libby (Greg) Nickoli, Drew (Kim) Miller, Angie (Jarrod) Daugherty, Jimmy (Christie) Kish, Joe Kish and Jared Kish. Great-grandchildren include AJ, Ellie and Trey Nickoli, Reyna and Dalton Foss, Ethan and Ava Samaneigo, and Leyton Nossa. Survivors also include two nieces with whom she has kept in touch ever since tearfully parting ways in 1951, Barbara Scheiner and Karin Scheina, both of Germany. Friends may call at the Herlihy-Chambers Funeral Home, 173 Park Avenue West, Mansfield on Thursday, March 14, from 12 noon to 2 p.m. when funeral services will be conducted by Deacon John Reef. Burial will follow in Mansfield Catholic Cemetery. In lieu of flowers, please donate to the Eucharistic Ministry at St. Mary’s Catholic Church, 1630 Ashland Road, Mansfield 44905 or Kindred Hospice in care of the funeral home. Elizabeth appreciated receiving the Sacraments when she could no longer attend Mass. Thank you to the staff of Arbors at Mifflin and Kindred Hospice for the kindness they showed during her last difficult months of life. To send flowers or a remembrance gift to the family of Elizabeth Fichtel Tiefenbach, please visit our Tribute Store. "Email Address" would like to share the life celebration of Elizabeth Fichtel Tiefenbach. Click on the "link" to go to share a favorite memory or leave a condolence message for the family.